The Good News is that registration income for continuing education units in Universities was much better this fall than fall of 2014. Better than the last five years in fact. With 38 percent of c.e. units in Universities reporting registration income UP over last year, that is great news. Over the last five years, we have seen only 25-35 percent of c.e. units in Universities reporting income up. Just two years ago, only 28 percent of c.e. units in Universities reported income up. The Bad News is that a huge 38 percent of c.e. 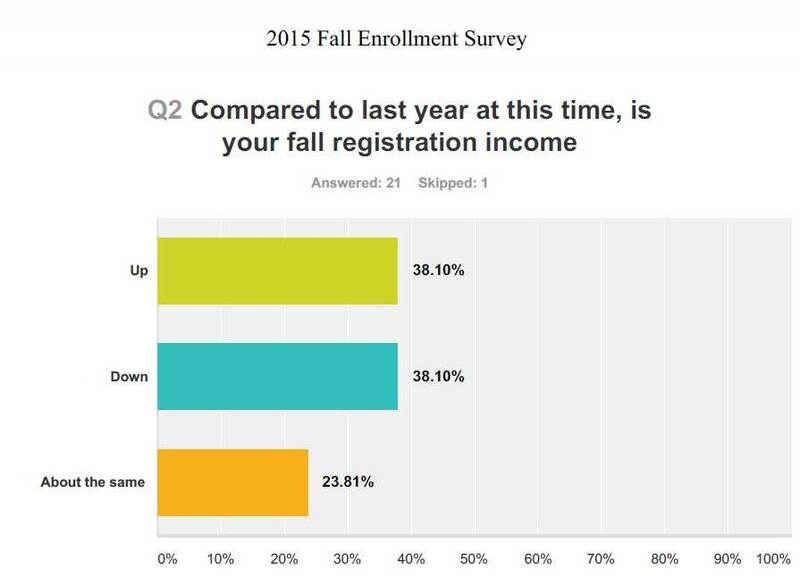 units in Universities reported income down this fall over fall 2014. This is maybe the worst in many years. Generally 30-35 percent of c.e. 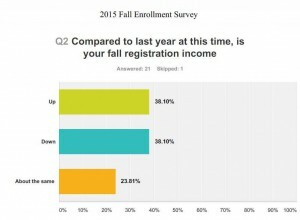 units in Universities had registration income DOWN in the past few years. Two years ago, for example, only 25 percent of c.e. units in Universities reported registration income Down over the previous year. While the Up numbers were about the same as those for continuing education units in community colleges, the Down numbers were much worse than those reported by continuing education units in community colleges this fall.